Flight turbulence: Passengers at Delhi airport. Travel agents say passengers are increasingly unhappy with the frequent fuel surcharge increases and they have started considering rail travel instead. Mumbai: The country’s domestic airlines have decided to increase Rs300 a ticket for the so-called fuel surcharge designed to combat the rise in the price of aviation turbine fuel (ATF), taking the levy up to Rs1,650 each passenger, as state-run oil marketing companies increased jet fuel prices by more than 14%. Jet fuel accounts for 40% of operating costs for domestic airlines and the domestic industry is estimated to spend around $1.9 billion, or Rs7,543 crore, annually on fuel bill, based on November 2007 rates. With the latest hike, the fuel surcharge alone will come up to Rs1,650 per ticket, apart from a Rs150 congestion surcharge and Rs225 passenger service tax payable to airports. In all, a passenger will end up paying Rs2,025 per ticket apart from what airlines call the “basic fare" of a ticket, which varies depending on the route, passenger traffic and the time of purchase of the ticket. “We will impose Rs300 per ticket on domestic travel from Sunday midnight," said Wolfgang Prock-Schauer, chief executive officer of Jet Airways (India) Ltd, which owns a fleet of 71 aircraft and operates 350 flights daily. Other airlines, too, are expected to impose this surcharge from midnight on Sunday. “We are constrained to hike fuel surcharge as there are no other options," said Siddhanta Sharma, executive chairman of New Delhi-based low fare carrier SpiceJet Ltd. Executives of other airlines expressed a similar view. A domestic airline, for its Indian operations, will have to pay Rs47,444.14 per kl at the New Delhi airport from Saturday against Rs41,417.33, up 14.55%. The price at Mumbai airport shot up 14.63% to reach Rs49,061 a kl, according to an update on the website of Indian Oil Corp. Ltd.
“There is no scope for reducing ATF prices until international crude prices come down, or the government lowers the taxes. We are not going to do business at a loss. If anybody can import ATF at a price better than us, they can do it," said Sarthak Behuria, chairman of IndianOil, the largest supplier of jet fuel in the country with 80% market share. Primarily, aviation fuel is supplied by three state-run oil companies IndianOil, Hindustan Petroleum Corp. Ltd and Bharat Petroleum Corp. Ltd.
“It is unfortunate that fuel surcharge is shooting up. I am frequent flyer and would continue to fly as long as my company is paying. But certainly, I will think twice before booking an airline ticket for my personal travel in the backdrop this high ticket cost," said a senior executive of a motorcycle maker in Chennai who did not want to be named. Travel agents said passengers are increasingly unhappy with the frequent fuel surcharge increase and they have started reconsidering rail travel. These agents, who receive a commission only on the basic fare of a ticket, excluding surcharges and taxes, have for long been critical of airlines levying fuel surcharge. “Certainly, the frequent fuel surcharges are going to adversely affect the passenger growth. But there is no other alternative. The government should lower the taxes (on fuel) to help airlines," endorsed Prock-Schauer. In fiscal 2007, airlines carried 35 million domestic passengers, up 39.50% from the previous year. The Centre for Asia Pacific Aviation, a leading consulting and research firm, projects domestic traffic will grow at 25% to 30% a year until 2010 and is expected to cross 60 million by that time frame. “The fuel surcharge will immediately hit the low fare carriers. Cost-sensitive passengers, who have just shifted from railways to airlines, will now consider going back. 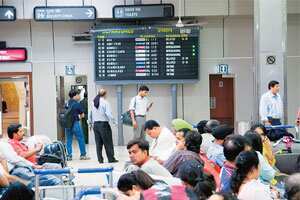 This is not a healthy trend," said M. Thiagarajan, managing director of Chennai-based premium airline, Paramount Airways. ATF for domestic operations in India is priced 70-90% higher than international rates. Even for international carriers, the fuel is priced higher than what is prevailing abroad. As an example, according to Federation of Indian Airlines (FIA), an airline industry body, an airline in India with an operating loss of Rs120 crore for the quarter ended 31 December 2006, would have reported an operating profit of Rs30 crore for the same period if fuel prices were closer to international benchmarks. FIA said bringing down ATF prices for domestic operations to international levels will result in an estimated annual savings of $624 million for the airline industry. Tarun Shukla in New Delhi contributed to this story.